Cook Time: 6 Hr. 10 Min. 1. Sprinkle roast with salt and pepper on all sides. In a large skillet over high heat, heat oil; brown roast on all sides. 2. Place onions in a slow cooker; place roast over onions. 3. In a medium bowl, mix tomato paste, 1/4 cup water, Worcestershire sauce, rosemary, and garlic; pour over roast. 4. Cover and cook on HIGH 6 to 7 hours or on LOW 8 to 10 hours, or until meat is very tender. Remove meat to a platter; cover and keep warm. 5. In a small bowl, whisk remaining water into flour until smooth. Whisk flour mixture into onions and sauce in slow cooker until thickened. 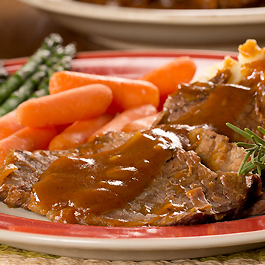 Serve onion gravy over roast. For more great recipe ideas, visit mrfood.com.